The Story World : Is it all just make believe? Of course, my problem at the time stemmed from the idea that a story is put together bit by bit, rather than something that is created whole. All in the same moment. Plus, I am a fly at the seat of your pants writer while my friend had a better grasp on undertaking the whole. Either way, in the last two months I have come across several novels that are so well put together that I am beginning to believe that even though having a believable story world matters, getting the reader into the story and keeping them there, starts inevitably through your delightful characters. 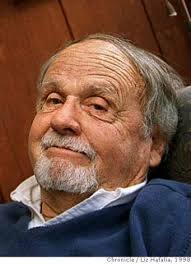 According to Donald Maass in his novel, The Fire in Fiction, you should use your characters (their experiences and opinions) to engage your readers, because that is what helps them to fully experience the piece. Don’t believe me? Try reading Uglies, The Maze Runner and Across the Universe. In each of these novels, the authors transport us to unimaginable worlds, by giving us characters we can root for, characters who are doing something from page, whether they are in the future, a secluded location or out of space. 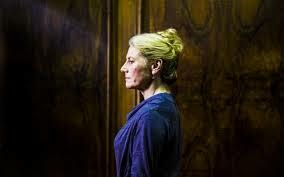 The location, setting is like the filler, the backdrop for the piece, that will help us get a deeper impression. But then every story required either more or less of this to feel whole. Or maybe this is one reason why outliners seem to have an advantage over plodders, but hopefully, thankfully in the end after we’ve all worked out everything, we will realize that with our own group of merry men and women (our first readers), we get to see where we went wrong or what needs more work. Because after reading all those “how to write a novel” books, the only thing that will tell us if we have succeeded or failed is our readers, and while you cannot please everyone, constructing a tight story will be worth it for the reader(s) who gets our work, and can follow the entire story. The reader will get into the story not just based on how believable the setting is, but also based on how our characters move around in the story world. They will observe what is happening to them, and if we do our jobs right, they will agree to follow these characters because something about their lives will ring out as true, even if they are faced with insurmountable odds. Because a story is crafted from beginning to end, even if we have to paint it a little at a time. So sustain the reader’s interest. Transport them to a place they haven’t been before and them keep them wanting more. This is the craft of a writer. Now, let’s begin! Survival Kit for Writers : What 5 Things Would You Carry? Marooned on a desert island for two weeks, with room for only five essentials, what would you carry with you? I ask this because as writers there are so many hurdles we have to overcome to be productive. I have since learnt that we can be enamored by a thesaurus, a tree and even an open window. Besides this, with so many gadgets available today, it is no wonder that in order to write, we have to cut ourselves off from all of the things we usually rely on, in our day-to-day living. If we really want this, we must unplug. Simplify our lives. And since we are in the business of writing, my fellow writers, I give you only fifteen minutes of reprieve here, to answer the question posed above. 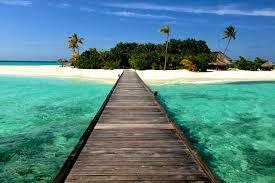 If you were marooned on a desert island, what five things would you carry on a two week retreat? For me it would include a solar powered radio (yes, music is essential), a stack of books, a pack of pens and pencils and someone to share the experience. How about you? 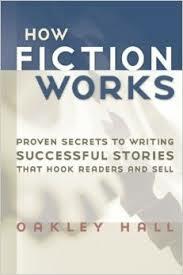 A fan of writing books, I’ve recently gotten my hands on a copy of Oakley Hall’s How Fiction Works which is filled with many great techniques. I will share two here. 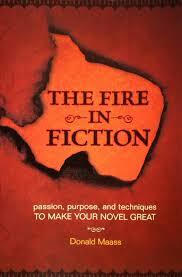 According to Oakley, “Fiction lives in the specific, the particular. It dies on the abstract and the general.” His example (makes everything clear) : Local man appointed to post. Greeted with a sentence like this, the ordinary reader would feel nothing. But change a few words and then everything becomes clear. Intriguing. 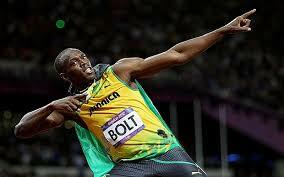 Usain Bolt appointed to Mayoral post (in Jamaica). Former President Bill Clinton appointed to UN post. Patrick Manning appointed to Presidential post (in Trinidad). If you know any of these men, then maybe right now, you are feeling something. If not, substitute the he for another public figure who interests you. Is the sentence better now? Good. (And in case anyone was wondering, none of these sentences are true.) Instead, they are merely examples used to get the reader interested. To make them read on. So thank you Mr. Hall, another writing technique learnt. She had a bossy sort of voice, lots of bushy hair, and rather large front teeth. Although I can’t remember the last two pieces of information, the first one definitely sticks out. Try to do the same for your characters. Make them memorable and like me, experiment with specifics, follow the rule of thirds and have a Terrific Week! Do you often carry a notebook to capture new ideas as they come to you? Or is it already filled with sentences, passages and articles that move you? As writers we are often told to carry a notebook, to write things down that we observe, especially the ones that make a deep impression. After all, great ideas are everywhere. For instance, something might come to you on the way to the post office, while you’re having dinner with friends, or on a trip to the zoo. So, carry a notebook. Reading this part, I cannot help but think about the opening scene of the movie, which seemed to capture the novel’s creepy sense of eeriness, dread and fright. Even though the clown and the things that happen to the children come a little later, I am always spooked, by that opening sense of calm. Is it the same for you? 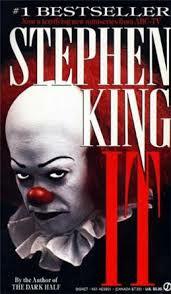 What horrific author penned a tale that has stuck with you from childhood? One that you often find yourself turning to for inspiration, impulse or chill? Remember when memory fails, our ability to capture our ideas will prove invaluable. So how or where do you capture your ideas? For me it is either collected and stored in a blue folder or written and reviewed from a small Champion notebook. In the notebook, I capture things as the come. With the folder, I look back searching for the next project or idea. 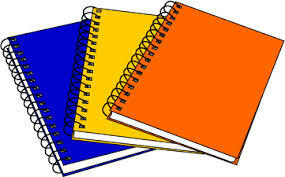 So, don’t forget… carry a notebook and enjoy the rest of the week! Read more. Both in your genre and everything else. What you want is to be familiar with the work of other writers in your genre. That way you’ll know what readers expect and also, be able to explain how your book fits in, but is different. So, what should you read? Other romance novels (if your genre is science fiction), thrillers, autobiographies, action-adventures, suspense, literary novels, short stories, poems and plays….everything else. It may provide you with techniques on how to improve your fiction. Learn from the stories you read, especially the ones that haven’t worked for you. Put yourself in the writer’s shoes. Think of ways to amend the story. Cut weak scenes. Imagine and add others that would make it better. Time permitting, write out one of these imagined scenes. Read it through. Does it work? Also learn from the stories that work. What were the scenes that stood out for you? Or was it the way the writer characterized their people or developed their story-world. Try to learn something from their various techniques. Pick one thing they’ve handled well that you would like to master and tackle it. Look for ways to make improvements in your own drafts. Read your revisions over. Does what you do work? Are the characterization methods, dialogue or plot twist coming out better? Remember readers like surprises. Or try your hand at something new for thirty minutes, one day of the week. Write a poem, if that’s not your usual medium, draft one page of a script, short story or short short. The idea here is to do something different. Subtle shifts in technique and craft can open you up to new ideas, associations. But as always be gentle with yourself, if it doesn’t work seek help or try something else. Last but not least, experiment. Push yourself beyond the limits of what you would usually do. (Which for some of us might be engaging with social media). Or for others a class in drawing, pottery making or improvisation. Take the time to grow. Learn new techniques that might help you to become a better shape-shifting writer, after all your characters are not the only ones who should move, and change and grow. 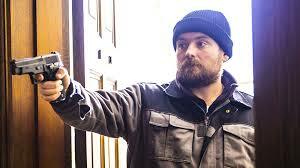 So last night (Tuesday) was the final episode of Utopia’s second season, which was great! Hopefully next year there will be another season. Unfortunately without Milner, the seemingly good ‘bad guy’ who, like everyone else, also had someone she loved. Someone she was willing to do anything for, which is a step in the right direction for an experienced writer. 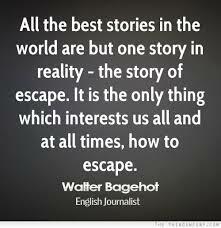 A good book, short story or play cannot (should not) have one dimensional characters because they will not be engaging enough for the reader. What can I say? It will be hard to let go of this action-packed alternative universe where something is always at stake, and we always seem to be fighting for man’s survival. 1. The current man of the hour, Wilson Wilson who apparently can give as good as he got. Seriously, he’s in a whole other level. Upped even Mr. Rabbit. 2. Next is the sometimes wimpish senior civil servant, Michael who is a tad bit tougher than where we left him in the first episode, willing to sacrifice everything to get back his family. The mystery of which hopefully will be revealed in the next season. And who could forget Ian. The IT consultant who has lost his brother. Not that anything else could show how far he is willing to go, his level of commitment, until he is asked to take a life. 5. 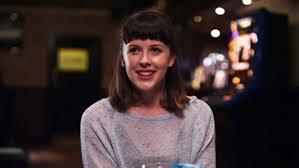 Finally there is Jessica Hyde, busy looking out for her brother. Father. Nothing else could show how much she has grown. So adieu Utopia. Thanks for an another interesting season! In our hyper-induced state of overwork sometimes knowing what to say no to can lead to some relief. However stopping for the writer may also cause stasis which would have been avoided if we agreed beforehand to focus and plunge on. 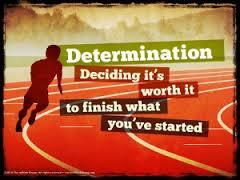 Or in other words to finish what we start. Forget the new idea that seems to toy with you, from the periphery. It is only a distraction. Write it down it you must but then get back to work. Wrap your mind around the idea of bringing that current thing to fruition, because every step will bring you closer to mastery. Control. Self-confidence. I am sure we all have drawers, shelves and folders of uncompleted work. But what if right now we decide that the project we are working on ‘now’ is relevant. What if for one minute we give ourselves the green light to focus on the work at hand. To bring it to a state of completion, doing away with the meddlesome voice in our head that is already searching for something better. Different. Or greater. Forget that irksome voice. The best thing you can do right now is to focus on the project in front of you. Bring it to fruition. 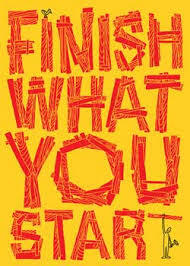 Yes, get into the habit of finishing what you start. Even if you have to resort to tricks, treats, mini-prizes, goals and mission statements. Nobody said it was going to be easy, so pace yourself. Train yourself for the long haul. How? By breaking big projects down into smaller, more manageable ones. Choose to write between 500-1000 words so you don’t unwittingly cause yourself to freeze, and whenever necessary take a break, and as always all the best with your writing!